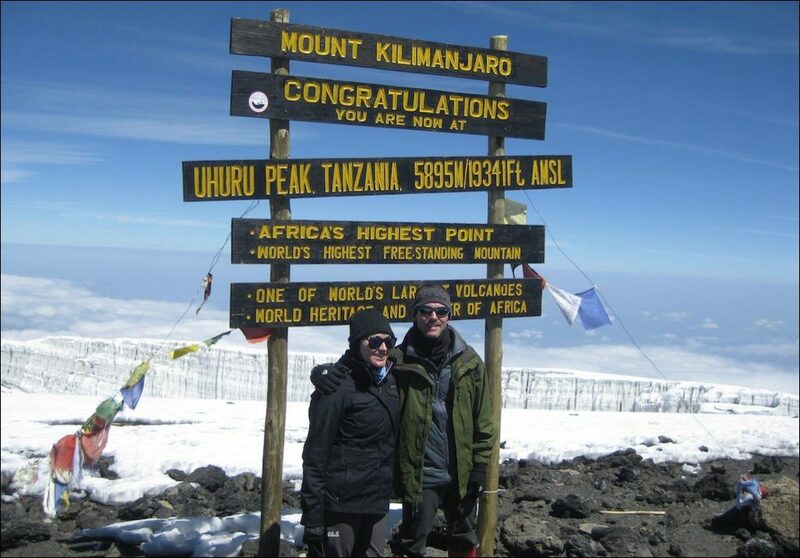 Guest post from Katie Cable who climbed Kilimanjaro in June 2015 with her husband Matthew. My husband and I were looking for an adventurous honeymoon and found it in Tanzania. 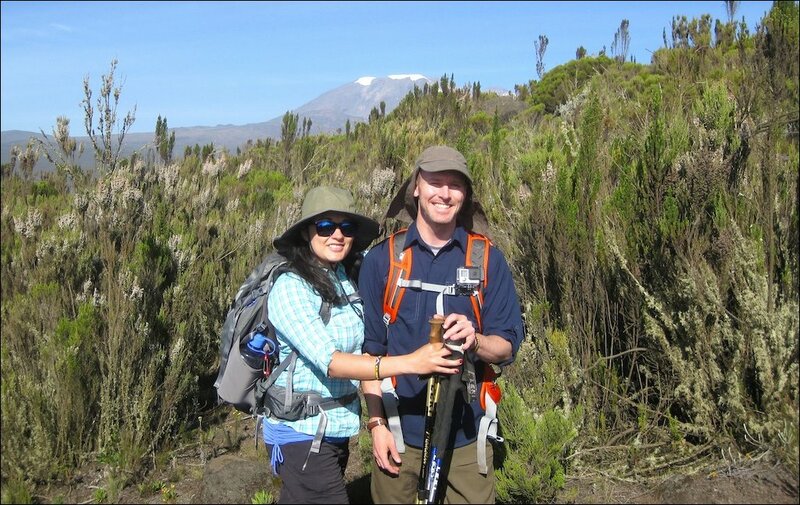 We were encouraged by family members to consider trekking Mount Kilimanjaro and were not disappointed by the experience. We are both in our early-30s, in good health and had no trouble with the climb. Neither of us experienced altitude sickness which we’ll give credit to a combination of living in Salt Lake City, taking Diamox daily and great encouragement from the guide staff and team members. We went with Tusker Trail who is based out of Nevada, USA and picked the Lemosho route during the month of June. They also facilitated a week-long trip extension to Zanzibar which was the perfect place to relax post-climb. 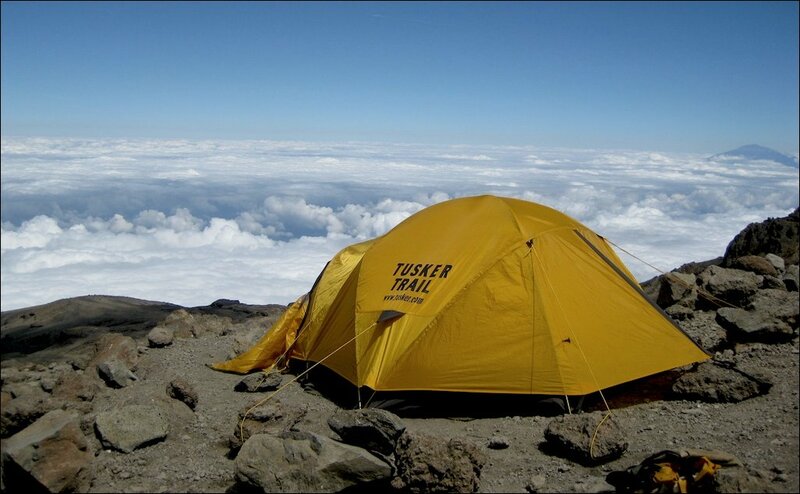 Tusker Trail has decades of experience summiting Kilimanjaro and their safety and success have allowed them to expand their offerings to other areas of the world that we hope to see one day. Since it was going to be part of our honeymoon, we wanted to ensure that all precautions were met. Our main concerns were highest chance of safely reaching the summit and that we wouldn’t be overrun with other groups on common routes. Tusker easily met all of these requirements. There are many other routes available outside of the traditional Marangu or Machame routes. We ended up choosing the Lemosho route (9 climbing days) which afforded more time for acclimatization and uncrowded vistas of the western side of the mountain and the Shira Plateau. My husband describes it perfectly by telling people if Kilimanjaro is a clock face, our route went from 9 o’clock to 3 o’clock and summit day takes you straight up to the 12 o’clock. All of Tusker’s porters are based out of nearby villages around Kilimanjaro and we’re confident that our guides – Thobias, Stanford, and Liberaty were the most experienced on the mountain. It was Thobias’ 174th summit! 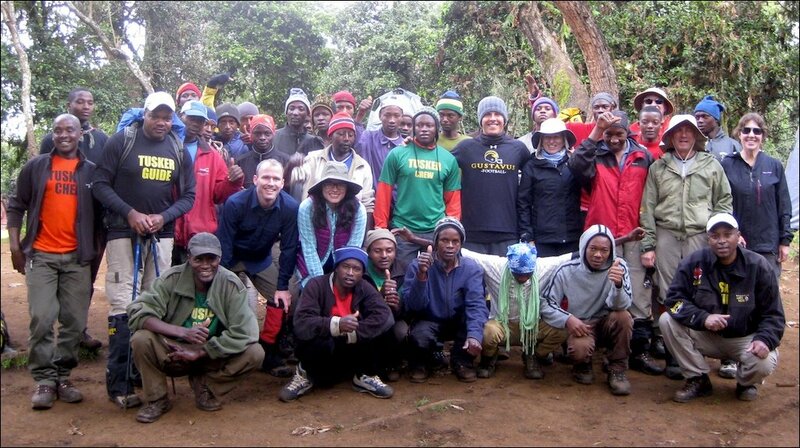 The crew and porters were picked for each climb by the guides themselves and not dictated by the company. There were over 30 in all for our group of 7 climbers. It was easy to see this made for a well-organized group that knew each other well and was fun to climb with. There were many small things that separated Tusker from the other outfitters, from sending the camp-master ahead early to stake out campsites before other groups, to thorough medical checks morning and evening. Everything from the moment we got off the plane, our transportation, meals, accommodations at the Bristol Cottages in Moshi, it was all taken care of. The food was fantastic with a mix of African, Indian and Mediterranean dishes. The weather in June is a perfect 50-70 degrees Fahrenheit in the day and around 30-50 degrees at night. We were lucky with no rain during our trek. Triple check to make sure you’ve got your camera and Go Pro because there is just so much to take in, the post-picture/video reviews give so much more to your story. Tusker was not the cheapest option, but the peace of mind afforded while exploring an unfamiliar corner of the world will make us choose Tusker Trail again for future expeditions. We would do it all again and add on a 2 or 3 day safari if we ever get that much time off again in the future. Katie’s story was originally published on TripAdvisor.